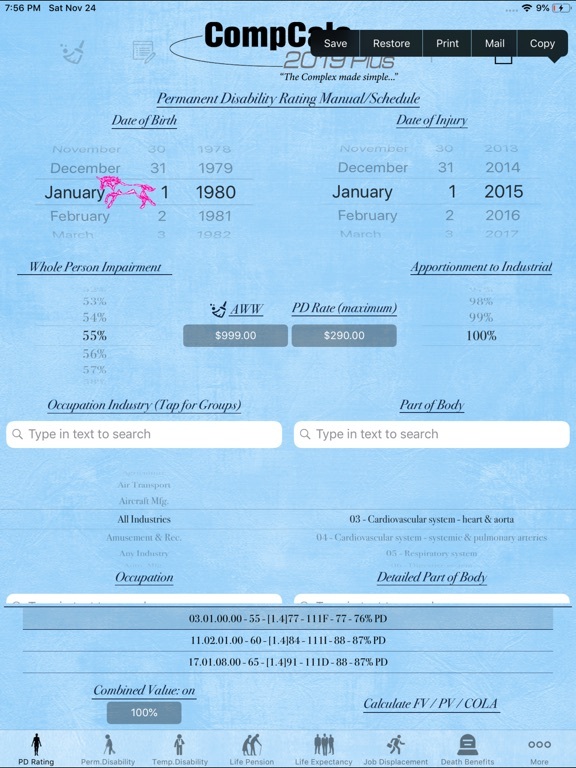 - The user can now input 0% Permanent Disability / Apportionment. 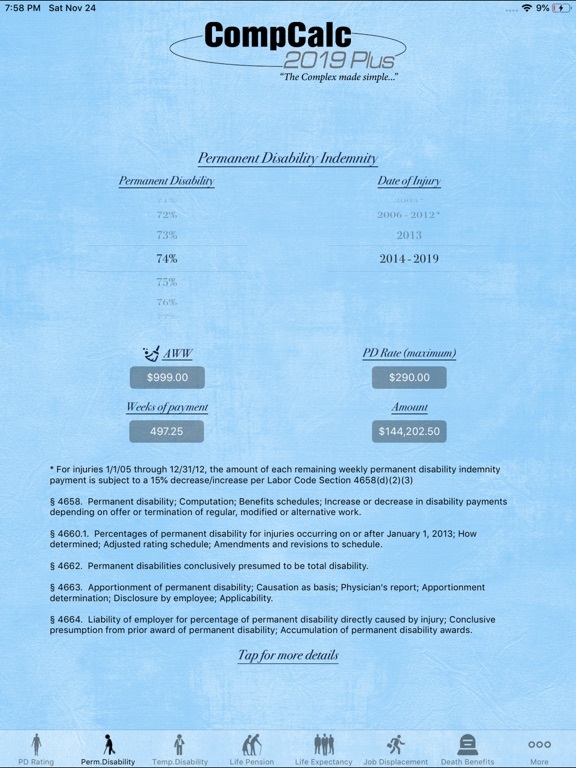 1) 2019 Temporary Total Disability Rates / Permanent Total Disability Rates. 2) Configuration to promote user inputted values to all screens. 3) Configuration for Life Expectancy (2008 / 2010 tables are available). 4) Configuration for the color of the background (image). - The CompCalc Plus uses and displays the 2010 Census Data for Life Expectancy (in purchased version you can also use the 2008 table). - It also has a Present Value (PV) and Cost Of Living Adjustment (COLA) estimator for Life Pension and Total Disability Awards. The PV/COLA calculator estimates the total Future Value (FV) / PV / COLA for a given percentage of disability between 70-100% based on Age at time of first payment, Date of Injury, and inputted PV discount rate / COLA inflation rate / PV Rate Discount Compound. 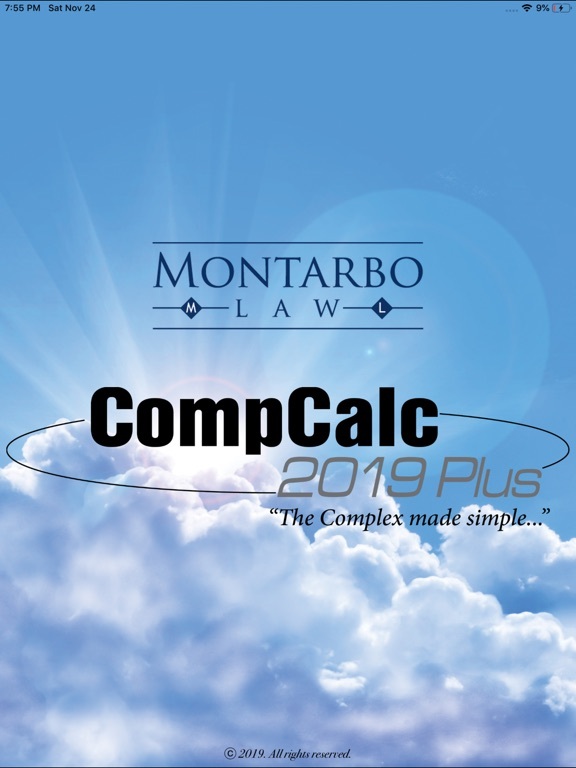 - Additionally, the CompCalc Plus includes the option with a tap of the screen to turn on or off the Combined Value Equation when multiple rating strings are involved. When the Combined Value Equation is turned off the adjusted PD for each rating string is aggregated rather than combined using the Combined Value Equation. 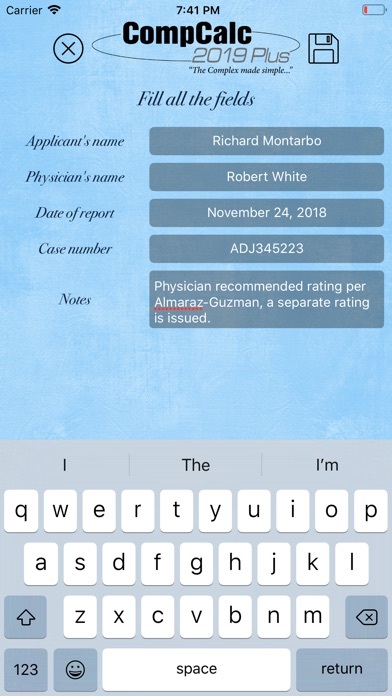 - It also includes a full PD rating schedule which automatically creates a rating string adjusting the WPI given the Part of Body, Age, Occupation, and DFEC. 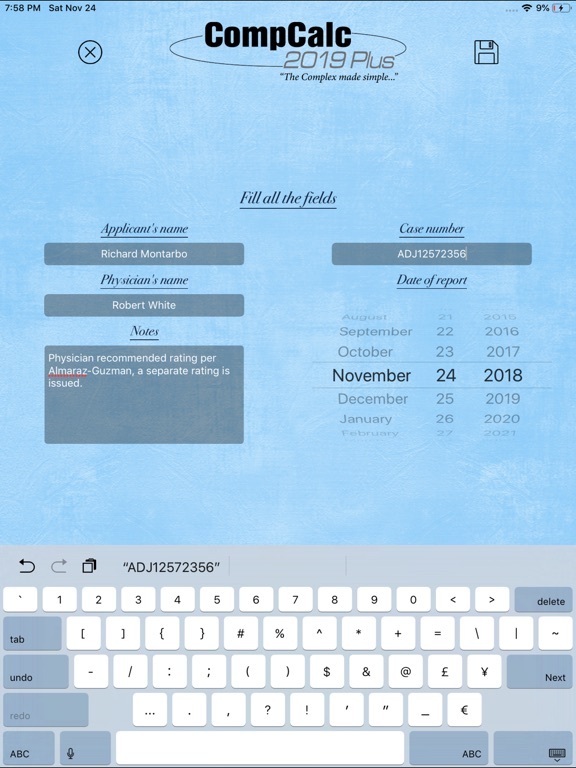 The Plus version also incorporates a relational database for Occupation and Part of Body making input intuitive and simple. - It has a Combined Vale Equation Module which computes CVE percentage and total indemnity given percentage numbers, DOI, AWW or PD Rate (defaulting to max). - The user has an option to override default TD/PD indemnity rate in all screens (always bounded by min and max values). 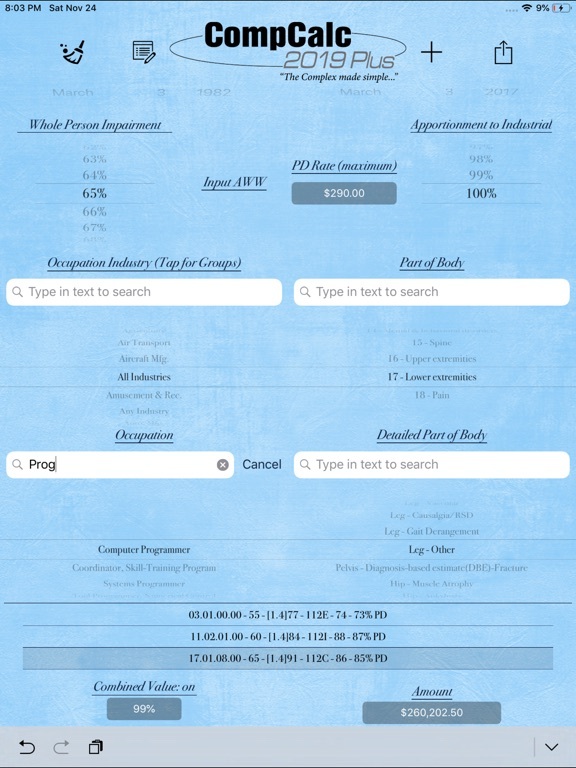 - The user can print, store or send the e-mail of COLA calculations. - Life Expectancy given the current age and based upon the 2008 / 2010 U.S. Life Tables as provided by the U.S. Census Bureau. 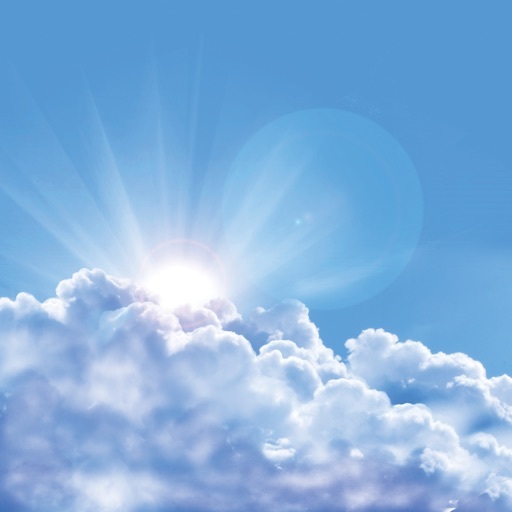 - Supplemental Job Displacement Benefits. - and Death Benefits, for the given date of industrial injury. 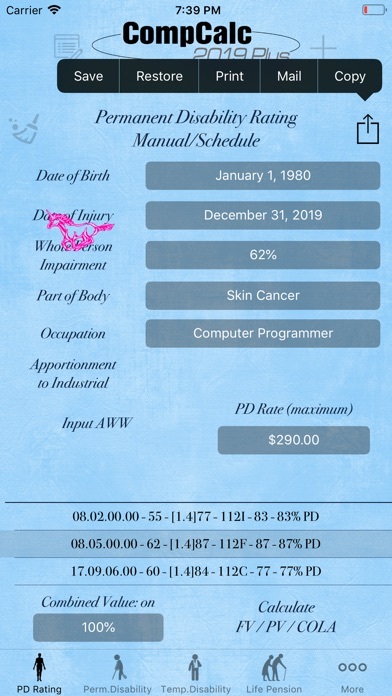 It also calculates TD liability for a given period based on the default max weekly rate for the date of industrial injury or a TD rate based on AWW manually imputed. 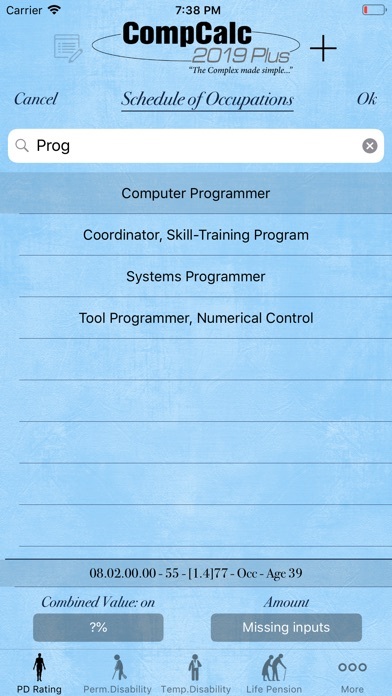 Other features also include a Date Calculator, full listing of QME/Body Codes, and full access to support and training videos. 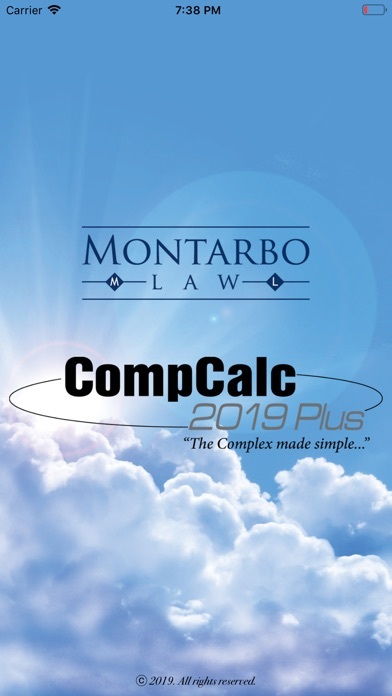 The CompCalc Plus is trademarked and copyrighted and is the property of the Law Office of Richard L. Montarbo with all rights reserved. The user can now input 0% Permanent Disability / Apportionment. 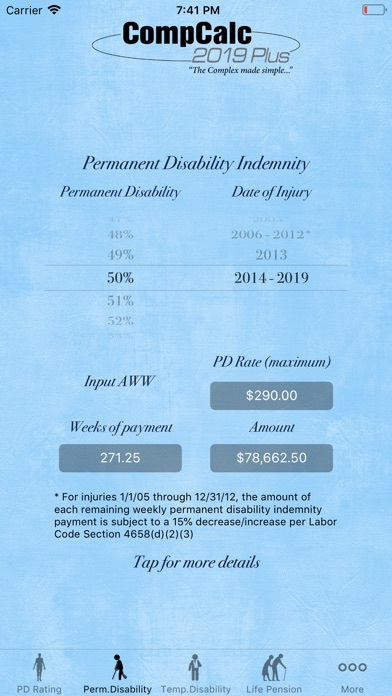 - 2019 Temporary Total Disability Rates / Permanent Total Disability Rates. - Configuration to promote user inputted values to all screens. - Configuration for Life Expectancy (2008 / 2010 tables are available). - Configurations for the color of the background image and icons. - iPad configuration to flip PD Ratings tables.